You may be familiar with hurricane categories. But what about Storm Surge? Believe it or not, more hurricane deaths are associated with water than with high winds. And the worst of a hurricane's water often comes from storm surge. How much do you know about Storm Surge? If you're relying with keeping up with the category of an incoming tropical cyclone to guide your in your storm preparations, you may be missing one of the most important factors. That could put you and your family at risk. You see, the full name of that set of numbers that shows the hurricane categories is the Saffir-Simpson Hurricane Wind Scale. It refers to sustained one minute wind speed. It doesn't measure hazard from water. If we pay close attention to a tropical cyclone's wind speed, but ignore the potential dangers from water, we do so at our own peril. Hurricane winds can be vicious - they rip off roofs. Storm surge can be even more deadly. Its destructive nature is either underestimated or ignored by many. It can tear homes from their foundations and washed them completely away. Unfortunately, there is a a generally low level of public awareness about this particular hurricane hazard. Perhaps that's why a lot of people don't pay much attention to the danger it poses. Some of the basics are explained here. When a tropical weather system heads for shore, it pushes seawater ahead of it. The bigger and stronger the storm while it is over the sea, the more water it is capable of pushing. That water comes onto land as storm surge. If you live along the coast, you are vunerable to storm surge. Even if you don't, you still may be. To understand the definitions of these two terms, you need to start at Mean Sea Level, which is the half way point between high and low tide for a particular location. Storm Surge height (or deepness of the water) is measured from mean sea level. If the event occurs at high or low tide, it will be more or less deep by the amount that the high or low tide varies from mean sea level. In the illustration above, the surge is 15 feet. Storm Tide takes into account both the normal (low or high) tide, and the surge tide. In the above illustration, if it comes in at high tide (which is two feet above mean) it will be a 17 storm tide. At low tide, it would be only 13 feet. Since the water coming in is not calm and smooth, waves on top of its surface can add even more height that the water can actually reach. Galveston suffered enormous damage from Hurricane Ike in 2008. Most of that damage came not from Ike's winds, but from the storm surge. Though the Ike was "only" a category two, it had a very large wind field - over 500 miles across. This meant it was pushing a LOT of water. Those cat 2 winds brought with them a much stronger storm surge - one like you might expest of a category four storm! This mobile home was tossed about by the surging water, which carried it back towards the sea as that water receded. Moving water is a powerful force. Just one foot of calm water is enough to lift your family sedan off the ground. Two feet, if it's rushing, means wave good bye to your heavy duty pickup or SUV as it's carried away. NOAA estimates the storm surge on Galveston Island varied from 10 to 17 feet. They found high water marks as high as 20 feet! The surge was even higher to the east of Galveston. What Makes a Big Storm Tide? Not all tropical cyclones come with a monster storm tide. But, when they do, watch out! Some coastal areas are more vulnerable to this hazard than others. You should make it your business to know if yours is one of those with higher risk factors. Some storms will generate a bigger storm tide than others. Know the characteristics of any system headed your way, and know that these characteristics can change. Stay updated on changes by monitoring official sources. It's never safe to assume that, if the storm isn't going to come ashore right near you that you won't be affected. You can be affected even if you are miles outside of 'the cone,' and well inland. Here's a case in point. When a hurricane has a large windfield, the storm surge can be much wider, too. And the damaging water isn't always limited to just a few blocks near the sea. Ike's powerful storm surge wasn't limited to Galveston, or even Texas. This picture shows a lesser, but still very damaging surge from Ike. The image is from Mandeville, Louisiana, some 300 miles to the east of where the eye came ashore. Mandeville is over 40 miles inland from the Gulf of Mexico. That's Lake Pontchartrain you see surging ashore there, not the Gulf. In a surge, the water can go from a depth of 0 to several feet in just a few minutes. If There are Surge Warnings? There's an old saying that goes "Hide from the Wind; Run from the Water." If your local authorities are warning of a surge, and you are in one of the zones, don't hesitate to evacuate. The size and timing of a surge can vary depending on a number of factors. It can begin well ahead of the arrival of the strongest winds. It can arrive, in some cases, even if the storm decides to just move along the coast without making landfall. Or not. But is it worth betting your life on it? Just go. The above photo, taken the day before Ike made landfall, shows initial flooding in a Galveston neighborhood. This was just the beginning. It would get worse! As you can see, anyone who hadn't evacuated at that point was pretty much stuck there. The eye of the storm was still a day away! Conditions were about to deteriorate to the point that even a boat would be useless. The time to evacuate is before the surge even gets close. Once it begins, it is usually too late. Are You in a Surge Zone? SLOSH stands for Sea, Lake, and Overland Surge from Hurricanes, a computer model that the NHC (National Hurricane Center) uses to estimate the depth to which water might rise in different areas during diferent categories of hurricanes. Once you've found the maps for your area by clicking on the location links, you'll see two sets of five maps. You want to pay attention to the one labled "Maximum Water Depth." There will be one for each category of a hypothetical hurricane, from 1 to 5. These are very generalized maps. During an actual weather event, the NHC would issue one pertinent to the current storm, using the applicable data. However, the maps do tell me that, in a Cat 2 storm, my property would have a good chance of staying above water. BUT, even a category one hurricane could put my escape route under at least two feet of water. That's certainly something to think about! Have You Ever Been in an Area Affected by a Storm Tide? I have lived where storm surge came ashore. If your area was flooded by a storm tide, I hope you were able to evacuate ahead of time, and that the water depth turned out to be less than predicted! Note that the fellow on the right is over six feet tall. About a year after Ike devastated Galveston, we visited there. Many of the scars were still showing. We were struck by the water marks that the storm tide had left on many of the buildings. At the time of landfall, in September of 2008, Ike's winds had weakened to Category 2. But, his surge was still strong. It was was like one you would expect to come with a Cat 4 system. Homes. even large, sturdy ones, simply disappeared, washed completely away by the surge. Debris from Galveston was deposited as far as 20 miles inland, carried there by the rushing water. In the picture above, you can see just how high the water rose on one particular downtown street. That building is some 15 blocks from the 17' seawall, which the water came right over! I am NOT a meteorologist and do not claim to be a hurricane expert. I live on the coast, and naturally follow tropical systems. I am happy to share what I consider a very basic layman's understanding that anyone should have who might be affected by this extreme weather. Please refer to the National Hurricane Center or another official source for authoritative information. Ultimately, we are each responsible for our own welfare and that of our loved ones during a natural disaster. We DID evacuate via water once... boarded a cruise ship and put out to sea, so I guess you could say that' was an alternate rout that time, at least. CruiseReady, In a way, that saying of Hide from the wind, run from the water can be taken as a warning of a storm surge's danger. It's far easier to find a hiding place from extreme winds than to think of being able to outrun water. Do you have an alternate escape route just in case Plan A ends up with water (such as you mention just with a Category 1 hurricane)? SO true about Katrina. Lots of people totally forget about the surge! In a city that sits largely below sea level, that's certainly not something to forget about! The south east of Britain can be subject to the threat of storm surges, as happened in 1953. These are caused round here by a combination of factors. High tide raises levels naturally, but low air pressure raises the sea surface, and very low pressure makes for a bigger rise. When these two factors combine and the wind direction is from the north the waters of the North Sea are pushed southwards, and between East Anglia and Kent on the British side and the Netherlands on the continental side, the sea becomes shallower, so a mass of water, already high from the combination of other factors, is pushed into the shallow sea. Add to this that the East coast at these points is quite low lying the combined factors cause serious flooding. The flood waters would race up the Thames and hit London, which has the Thames Barrier to prevent this flood reaching the city, but we are now thinking that the existing barrier will need upgrading as sea levels rise.Downstream of the barrier we have massive embankments to contain the water. But there is another problem about which we can do nothing, that Britain is slowly tilting, with the South East sinking by two millimeters a year, and so over time the danger of flooding will become worse. There was a near miss last year when there was some flooding, but it was not as bad as the storm of 1953. I have been to Mississippi after Camille, and seen three large ships beached, and about three city blocks deep from the Gulf of Mexico in total devastation. After Katrina the situation was even worse. One of only a few structures to survive was the Biloxi lighthouse. In 1900, Galveston had the Gulf literally claim three city blocks, the land is even gone. But, in Katrina the storm went to a category 5 as it passed over a warm eddy, then dropped to a category three. 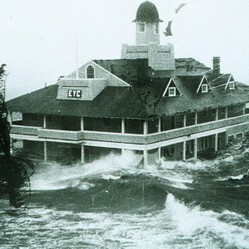 The surge did not have time to adjust, so while the winds were only a category three at landfall, the surge was that of a category five.